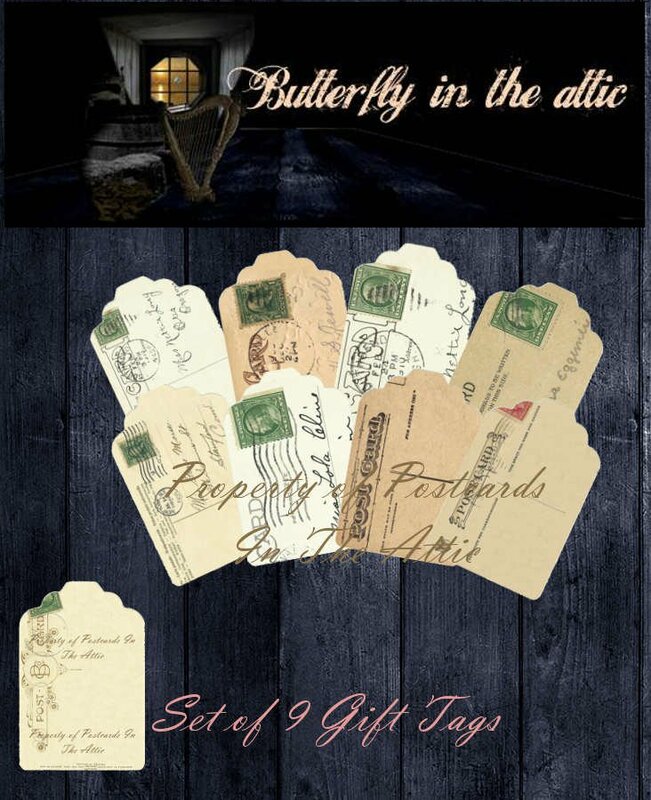 Vintage Postcard Backs Gift Tags Set - Download, Print, Cut, Tie, DONE! The tags are set to be used with a 2 11/16 inch (3 inch) Recollections TM die punch but the PNG file can be resized to fit any punch. You can also simply cut them out with a scissors. - You will be able to UPLOAD the JPEG file IMEDIATELY after payment. This is my first time using this Great Etsy feature so if there are any issues please email me at PostcardsInTheAttic [!at] gmail.com and I will assist you within 24 hours. All items can be used for personal use. The copyright belongs to Postcards In The Attic. With your purchase, you are being granted permission to copy and print the design for personal use. - YOU MUST PURCHASE FOR COMMERCIAL LICENSE ($20 per item) then and only then is credit not needed. For all personal or nonprofit use Credit not required, but appreciated. - This element is non-transferable; it means that you can’t give the license to anyone else. - Use any part, or the entire sheet, to put into your own digital collage sheet to sell as your own. - Sell printed sheets of my images (whole sheet or part of it). - Make Supplies (such as inchies) and sell it. - Sell my items as a part of scrap-booking kits. - Share purchased files with other people (You can refer them to my shop). - Mass reproduce (The large-scale manufacturing and the wholesale production). - Re-sale my digital images on CD’s. - Claim copyright after purchasing. All rights reserved for Butterfly In The Attic. Please Note: These are 300 DPI digital images- no actual paper will be sent. Images are instant downloads and are saved in jpg format for perfect printing. Print them anytime you need for projects.